I’ve been having a renewed love affair with Parm ever since I learned to make omelets last week from a pair of former monks. It was the kind of evening I love: a big dinner out, a few drinks back at the house, followed by a kitchen dare. In this case, the dare ended with a vigorous round of omelet-making at about 10 p.m. on a Thursday accompanied by a little scotch. I’ve been making omelets with fresh herbs and Parm ever since. When Jeff the Trappist came to Philly to run the marathon recently, I knew I had to see his omelet action. After all, how good can an omelet be? To me, it has always tasted like a potholder – one of the least enticing dishes on a menu and something I rarely attempt unless I am in a bitter mood with poorly behaved guests over for breakfast. Jeff schooled me on The Omelet. And I have been practicing every night. The key to a stupendous omelet is, apparently, a decent omelet pan (Jeff recommended a small All-Clad frying pan), a couple tablespoons of canola oil, and a pat of butter. You brown the butter in the oil, essentially, so that you get the taste of butter without burning it at high heat. Jeff kept sniffing at the bubbling pan until it smelled right to him – and when the fat was at a super-sizzle, he dropped in a pair of whisked organic eggs, and I stood back as that yellow liquid puffed up like a butterfly. Then, Mr. Trappist Omelet shook the pan vigorously over medium heat, fluffing the eggs for about 20 seconds, before adding a sprinkle of Parm, a pinch of salt. Within a minute, he’d tumbled the whole thing into a pretty fold, plated it, and topped it with black pepper. It was the lightest cloud. I nearly wept. Monsieur Fromage and I have gone through two cartons of eggs in the last week. We have cleaned a lot of splattered yolk off the kitchen burner and spent a lot of time at the sink, working up to a flip. Our omelet-offs are always hair-raising, and usually there is some shouting, and the dog darts to her kennel, and I get very bossy and Monsieur Fromage scowls, but then we sit down with knife and fork and bite in, and we get very settled looks on our faces. An omelet is such a mood-mellower. We are still approximating the Omelet Monk’s fluff-master-deluxe level of virtuousity, but we are getting very close. When our omelet doesn’t end up on the floor, it tastes buttery and so light, much more like a quality bed ruffle than a potholder. The Parmigiano-Reggiano is, secretly, what makes it. I always keep a plate of it freshly grated on the top shelf of the fridge now. Actually, it’s just past ten – a perfect time to crack a couple eggs and work on my serve. The star cheese of our Thanksgiving plate was a little French wheel washed in brandy. I’d read about it in The Cheese Primer, in Murray’s Cheese Handbook, and in a book on pairings by Janet Fletcher, Cheese and Wine. Here was an old monastery cheese that was rumored to taste like meat and garlic, an Old World stinker perfected by monks. Époisses is also rumored to be banned from French trains due to its smell. So, I expected a real whiff-burger, but my wheel of Epoisses did not stink up the fridge. And it did not offend our brazen band of dinner guests, who spent a whole afternoon eating and drinking around the cheese board while Monseiur Fromage prepared his time-consuming “Turkey in a Shroud.” The real key, though, was pairing this cheese with a great wine. Wow, the white Burgundy that several Internetters recommended brought flavors out of this cheese that were absolutely novel to witness. Rarely have I enjoyed such an optimal pairing. We drove to New Jersey to find a bottle of 2008 Joseph Drouhin Saint-Véran (about $15). Cooled it on the back stoop, brought the cheese to room temperature, and let our couch-clan of tasters descend. The response was YouTube-able; a sip of wine after a nibble of Epoisses had everyone’s eyebrows on the ceiling. “Oh my god,” exclaimed our Blue Cheese Brit, who had just arrived with a bag of delicious patés and cheeses under his arm. With all the hype, Époisses may sound scary. I found it surprisingly tame but perfectly balanced. It’s a bit whiffy, but only when you take it out of its round package – the fragrance calls to mind onions, mushrooms, a damp carpet of leaves. The taste, however, is wicked; think of a brandy-spiked venison pate, then add a velvetine mouthfeel, and give it a tangy orange rind. Wine-and-cheese guru Janet Fletcher recommends serving Époisses with a Riesling or a Dry Pinot Gris, while others suggest a Cab. Frankly, I would never serve it without the Saint Véran white burgundy we enjoyed over Thanksgiving. It was truly…it sounds canned, I know…but I mean it: astonishing. 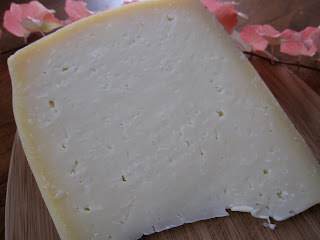 Keen’s Cheddar: a flawless raw-milk farmhouse cheddar that our friend, the Blue Cheese Brit, calls his old steady. He says it’s “a must” in any gentleman’s crisper. Forsterkase: A bacony-flavored, washed-rind, raw-milk cheese from Switzerland that is cured in spruce bark. Yes, bacony! This is a fantastically heady and bizarre cheese that calls to mind hunting lodges and men wearing wineskins into the woods. The rind looks like a dirty hiking boot but is whack-delicious in a herdsman kind of way. Yes, yes, that is the famed "Turkey in a Shroud." There's our bird after two days of marinating in a mustard rub. The cheesecloth shroud was draped over her at half past twelve, and she was basted every quarter hour, which meant that she wasn't ready until almost 7:30 p.m. Was she a fine bird, our little Nefertiti? Oh, she was. Last night's tasting was a great success. Quince, the little cheese shop in my neighborhood, looked beautiful -- full of flowers, baskets of bread. The cheese case was stocked, the shelves lined with chutneys and nuts. When people began arriving, I felt my first twinge of holiday spirit. Our hosts, Joan Sauvion and Nicole Marcote, who own Quince, plated our three cheese selections so beautifully. We started with warm Cana de Cabra, drizzled in orange flower honey with pine nuts, and ended with a glass of sherry and a wedge of leaf-wrapped Valdeón accompanied by a bit of fig cake. The triple-creme Brillat-Savarin proved to be the big hit -- a sensuous cheese that needs little in the way of dressing, but Nicole's idea to serve it with an apricot and some marcona almonds was a stroke of genius. Brillat-Savarin really is a perfect holiday cheese. The texture is satiny, rich, and the flavor is mild and slightly sweet -- easy on the palate during months when most foods we eat are heavily spiced. It makes a great dessert course, so easy to prepare. Just let it come to room temperature and serve it with berries, like cheesecake. It's also perfect alongside a champagne toast -- who doesn't like bubbles and brie? We had such a great time last night that we've already set the date for a second tasting, Saturday, Dec. 19. We haven't chosen a theme yet, but if you have ideas...hmm? Today's cheese tasting at Quince is sold out! Yee-haw. Here's the recipe I'll be sharing for a quick Thanksgiving side dish. It's adapted from a Deborah Madison recipe that I've had marked for about the last three years. I tested several versions last weekend, using different cheeses; the original recipe called for gruyere, but that got gluey when baked. The blue cheese melted beautifully, combining with the cream to form a piquant cheese sauce that was a pleasant contrast to the sweetness of the pumpkin. 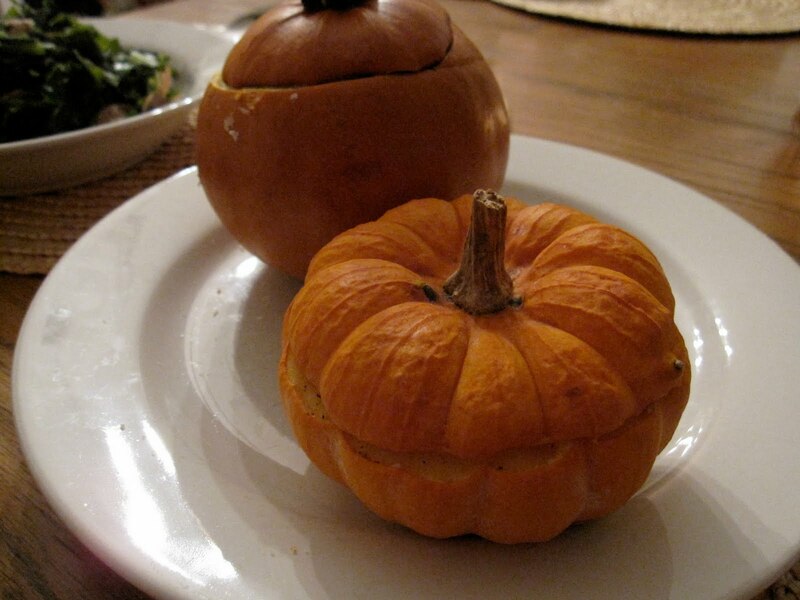 You can use ornamental pumpkins for this dish – yes, the squat, ridged ones that most people use as decorations. Several people at my local farmers’ market expressed skepticism about this idea, insisting that these squash were merely decorative, but I baked them up, and they tasted wonderful – similar to acorn squash in flavor and texture. In fact, they were tastier than the small pie pumpkin I also tried for this recipe. The nice thing about this recipe is that you can adapt it to the number of guests at your table, and very little prep is required, other than slicing off the caps of the pumpkins and scooping out the seeds. The presentation is simple and memorable – who will forget the year you served baby pumpkins stuffed with blue cheese? Preheat the oven to 350 degrees and slice off the top of the pumpkin, scooping out the seeds. Rub the inside with a dash of salt. Pour in the cream, cheese, and add several cranks of black pepper. Replace lid and bake in pan, 45-50 minutes. Serve hot. *I used Roaring Forties Blue, which is on the sweet side and very creamy. Hook’s Blue Paradise (from Wisconsin) or Cashel Blue (from Ireland) would probably be comparable. I’ve never been a brie freak, probably because brie is the hummus of English departments, and I overloaded on it at mixers during grad school. So often brie is rubbery, flavorless – glue on toast. I almost never buy it unless I am hosting people I don’t know well, then I figure it will be a pleaser. Today, however, I took a whole wheel of Pierre Robert, a French triple-crème, into my Fiction Workshop – an exceptionally good class this year. I felt it was time to induct these 15 students into the world of cheese now that they’re seniors. And, come on, eating brie is an English major’s rite of passage. I wanted them to sample the good stuff. Pierre Robert was recommended to me by a local cheese maven, and her recommendation was spot on. I’ve been reading a lot about Brillat-Savarin lately (also a triple crème), which I’ll be serving this Saturday at my first public tasting. From everything I’ve read, Brillat-Savarin is body butter – rated #2 sexiest cheese in my Murray’s Cheese Handbook. So, I was curious to see how Pierre Robert compared. Mmmm…it was decadent. Pierre Robert has the texture of a mousse, dense and yet light. The rind melted on my tongue – not the least bit rubbery. And the flavors were more potent than I’d imagined, grassy and peppery. I’m still a stink-bomb lover – the blues have it – but I will buy the Pierre Robert again, for picnics, for hot-night desserts. Bring on the champagne, or, as one artisanal cheese site recommended: Tequila Sunrises. My students definitely passed the brie test. Honestly, I thought they’d find the mold off-putting, but they descended on this snow-white cake like a pack of writers, which is to say, like wolves! Even the box went out the door under one person’s arm. So, I guess there will have to be more cheese inductions for senior English majors. Maybe I’ll work up to a salty wedge of tongue-numbing Cabrales. My mind is working on a list of cheese-and-writer pairings – hmm…what cheese would go well with Joyce Carol Oates? One of the things I like to do when I can’t fall asleep is dream up menus. It’s a strange obsession, I know. Lately, I’ve been giving a lot of thought to the Thanksgiving dinner I’m planning for my Pops and his wife, Dayle, who will be flying in from Iowa. I’m even considering changing the name this year to…yup…Cheesegiving. - Ezra Poundcake posted a butternut squash casserole recipe with cheddar cheese. This could be a nice change-up from sweet potatoes with marshmallows. - Who doesn’t love a cheese appetizer, or an amuse served after the salad course? The Cheeselover posted about tumblers full of marinated goat cheese served with a mini baguette. It looks fairly easy to recreate, although she doesn't give an exact recipe. - Blue Kitchen’s wild mushroom casserole with ricotta has me moaning within. Maybe for supper the night before Thanksgiving? - I have a weird food crush on Closet Kitchen’s Jalapeno Popper Dip. It’s a little bit bowling-alley, but it would make for great nosh while people are chopping. - Homemade butter at Food in Jars looks like something good to have on hand. I'm a cheese lover and a butter gal. - Because I hate the thought of not having a solid breakfast before I start cooking, here’s what I’m thinking for Thanksgiving morning: Smitten Kitchen’s Bloody Mary’s, baked eggs, and chive biscuits. I’d add some cheddar to the biscuits, of course. Finally, I can't resist previewing the baked blue-cheese-stuffed miniature pumpkins I tested the other night, thanks to Deborah Madison. The photo is at the top of this post. I'll be sharing the recipe at this Saturday's tasting, then I'll post it online. I think it's the best of Cheesegiving in a shell -- blue cheese, cream, black pepper, and individual pumpkins, all baked into a glorious blend of sharp, sweet, and saucy! What are you making for Cheesegving, dahhhhlink? On Friday, I made a great discovery: there’s a cheese importer in my neighborhood. Tucked amid the row houses, two unmarked garages function as a wholesale warehouse for International Food Distributors Inc., a company that’s been in business since 1939. I can’t believe I’ve been walking my dog down this block, past coolers full of triple-creams, shelves of stilton and manchego. Somehow I have to believe that this is not just a coincidence, that it’s destiny. Trugole, a beautiful cow’s milk cheese from the Piedmont region of Italy, was one of the cheeses I tasted on Friday, when I toured International Food Distributors in preparation for next weekend’s tasting. Nicole Marcote, of my local cheese shop, Quince, was kind enough to make the introduction. I spent an hour in the cooler with a broad-shouldered she-Viking named Jayne, who was kind enough to school me on some of her favorite cheeses, including this one, a staff-favorite at International Food Distributors. In fact, when Jayne took the wheel into the cutting room, about five people appeared, noses in the air, sniffing. “Is that Trugole?” each one asked. There is something infinitely snack-worthy about Trugole. It’s full-flavored and fruity, and it pairs well with just about anything – fruits, nuts, olives, cured meats. It was especially good on a sesame-crusted baguette. Trugole (pronounced True-goh-lay) comes from the foothills of the Alps, where the mountain grasses and foliage must be heavenly, because the sweet notes in this cheese are out of this world. This is a washed-rind cheese, and for every day of Trugole’s 60-day aging process, the wheels are turned and sprayed with water and salt. The result is a pleasantly sharp semi-soft cheese that I think would fit nicely on the Thanksgiving table, especially if you have risk-averse friends who might shy away from stinkier business. Trugole would be a great mediator – a cheese to impress the foodies and the non-foodies. And it melts well, which means it would be great at midnight when you are contemplating a grilled turkey sandwich and scrabbling about the crisper for a cheese that can hold its own against layers of cranberry sauce and gravy. Mmm…I’m already dreaming about leftovers. Dangerous. It's official. I've teamed up with my neighborhood cheese shop to host a tasting, and you, my beloveds, are invited. See that card above? That's my lifeline -- when Quince opened three years ago on Girard Avenue in Philadelphia, I just about lost my mind. I peered through the window and saw wheels of blue-veined Valdeon, slabs of Spanish ham, and...wheee...cornichons! Amid the check-cashing stores and nail salons, here was a reprieve. WHEN: Saturday, November 21, 4-6 p.m. I look forward to noshing with you. If you've never been to Northern Liberties, this is a great excuse to visit the famed Piazza and pick up a Brown Betty cupcake on your way home. Ooo...one more thing. If you're looking for other pre-holiday things to do, check out the cranberry-preserve canning classes that Marisa is offering over at Foodinjars.com. The dates are below, and there's a registration link on her site. 3 - 4: 30 p.m.
I’m so impressed by The Master Cheesemakers of Wisconsin (University of Wisconsin Press, 2009), a new book by James Norton and Rebecca Dilley, I hardly know where to begin. First off, the pictures are exquisite, capturing the essence of small towns in rural Wisconsin and the dairy hives within them. What Robert Frank did in the 1950s, capturing stark images of post-war America, photographer Becca Dilley does for the cheese state, peeling back the shrink-wrap to give us glimpses of Amish milking barns and portraits of hair-netted men with muscled fingers stirring curds. She captures the zeitgeist of artisanal cheesemaking. What Dilley does in her photographs, Norton does in his writing, creating intimate scenes rather than lists of facts. The reader follows Cedar Grove’s Robert Wills into his living wastewater treatment plant (it looks like a lily pond) and learns about his annual curd-fattened bluegill fishfry. Doug Peterson, of Mazomanie, talks about how he left a large dairy cooperative in order to develop a cheese for high-temperature pizza ovens. What this book does, unlike other primers and atlases I’ve picked up, is connect readers to the impassioned few who dream up cheeses like Faarko, maple leaf cheese, and cinnamon-rubbed butter jack. Dilley and Norton, who are part of the Twin Cities food blog Heavy Table, embarked on this book project to explore the Master Cheesemaker Program run by Madison’s Center for Dairy Research, an organization that Norton describes as “a Jedi High Council of Dairy Knowledge.” The program takes between 13 and 15 years to complete and has certified 44 Master Cheesemakers in the state of Wisconsin, as of 2008. Dilley and Norton set out to meet each one in person. The book is organized by region, with useful maps, tasting notes, and visitor information. It’s a pleasure to look at and worth keeping in the kitchen by the cheese board or on the coffee table during a tasting. But the thing I admire most about this project is the storytelling, done through both words and pictures. The Master Cheesemakers of Wisconsin does what more cheese books ought to do: it connects us to the hands behind the wheels. It’s been a very long time since I went to a spontaneous dinner party, but tonight was a full moon, and the time change made everything seem possible. So off I shambled, summoned to a last-minute harvest supper. It was a good thing I had a blue cheese to fit the mood. I threw it in a bag with half a bottle of sherry. Voila: dessert. People sitting around on stools. A chopped apple salsa w/ purple onion, ginger, cilantro, and lime juice. Experiments in the oven, in this case: lavender-infused pork chops. 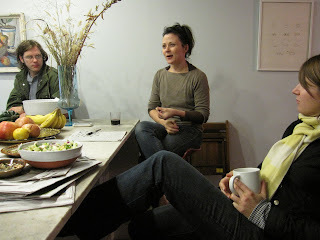 My friend Shanta put on an exquisite feast in her converted garage. The best part was watching everyone chop squash and fry bacon and sip wine around her great big counter. Some people just ate pumpkin seeds and read the Sunday New York Times, which felt truly decadent. The Roaring Forties Blue fit right into the beautiful whirr of it all. I can think of no other blue that makes a more perfect dessert. Who doesn’t love a cheese that comes in sapphire wax (spectacular by candelight). And the texture, it’s like cheesecake – ultra-creamy, sweet-sharp, with a complex, grassy head and a burnt sugar finish. Truth is, I’ve searched for Roaring Forties Blue since I read about it on Miss Cheesemonger. What a delight to come upon it this weekend, unexpectedly, in the cold case of a small Center City market, where a grab basket of wedges drew the cheese-curious. There it was, my Roarting Forties, a peacock in the mix. Roaring Forties hails from King Island, a craggy blip off the Australian coast. The island has a strong dairy industry, and it’s thought that seed from shipwrecks during the 15th and 16th centuries washed ashore and created the lush grasses that make the milk so rich. King Island cows are renowned for their sweet milk. The name "Roaring Forties" is actually the name of a gale. So, there you have it: shipwrecks spontaneously generating pastures, cheese shops mysteriously appearing with curious cheese, and harvest parties happening spur of the moment. Synchronous cheese+spontaneity. Could there be a more auspicious beginning to November?